George Zimmerman's defense rested their arguments Wednesday, without testimony from Zimmerman himself—and boy, were they ready! This morning, Judge Debra Nelson said she would allow defense lawyers to show jurors a computer animation of the disputed scene between Trayvon Martin and the man who stands accused of his murder, but wouldn't admit it into actual evidence for them to consider during deliberations. She also denied their request to show the jury text messages from Martin's phone, in which he purportedly discussed fighting and guns. “Your honor, we’ve been working very long hours," exhausted Zimmerman defense attorney Mark O'Mara pleaded after a 12 1/2-hour day in court. “So have I!" Seminole County Circuit Judge Debra Nelson shot back. O’Mara continued: “Your honor, we don’t have time to prepare our witnesses,” he said. “We’re recessed... it is now 9:57 p.m.,” Nelson said. Visibly exasperated, defense co-counsel Don West continued to address the judge as she began to pack up. "I don’t think I can physically keep up this pace much longer ... weekend depositions and at night,” he said. Ignoring West, the judge walked off the bench—arms full of paperwork. Instead, attorneys on both sides wrestled with a foam human-shaped dummy on the floor of the Florida courtroom. Also on Wednesday, an expert testified for the defense that he believed Martin was in better physical shape than Zimmerman. "He would find himself lacking when compared to Mr. Martin," the Public Safety consultant said of Zimmerman. “The court is entitled to ask Mr. Zimmerman about his determination as to whether he wants to testify,” Nelson insisted tersely after West objected to her line of questioning. 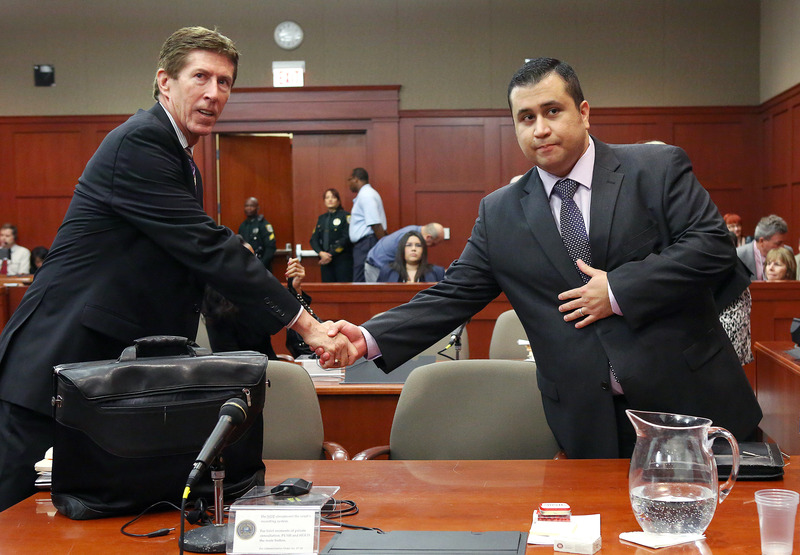 She looked back at Zimmerman: “How long do you think you need before you make that decision?” she inquired again, as the defendant—who had a minute earlier been made to raise his hand and swear under oath that any decision whether to testify would be his—turned to his counsel for help. “I object to the court inquiring of Zimmerman about his intention to testify,” West whimpered for a second time. “And I have O-VER-RULED” Judge Nelson spat back—several time—as the objections kept coming.